The Light Infantry was descended from the original light troops that formed what were known as ’light companies’ of line infantry regiments and later regiments in their own right. These soldiers were trained to act independently on the battlefield, within the framework of the battle, as skirmishers. 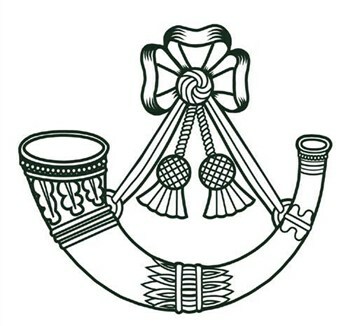 In this respect, the Light Infantry shared many characteristics with the old rifle regiments and their descendant, the Royal Green Jackets, with which the Light Infantry formed the administrative Light Division. The Light Infantry though was not a rifle regiment, and the majority of its traditions resembled those of the ordinary line infantry regiments. Prior to 1914 the various light infantry regiments wore the same scarlet and blue full dress as the line infantry, being distinguished solely by their dark green cloth helmets and bugle horn badges. The uniforms of the Light Infantry as created in 1968 did however have much in common with those of the rifle regiments: dark (Rifle) green No 1 dress tunics, rifle green berets and stable belts and black officers’ shoes. The separate identity of the light infantry was however maintained by the retention of details such as the dark blue trousers also worn in No 1 dress and the red sashes of sergeants.